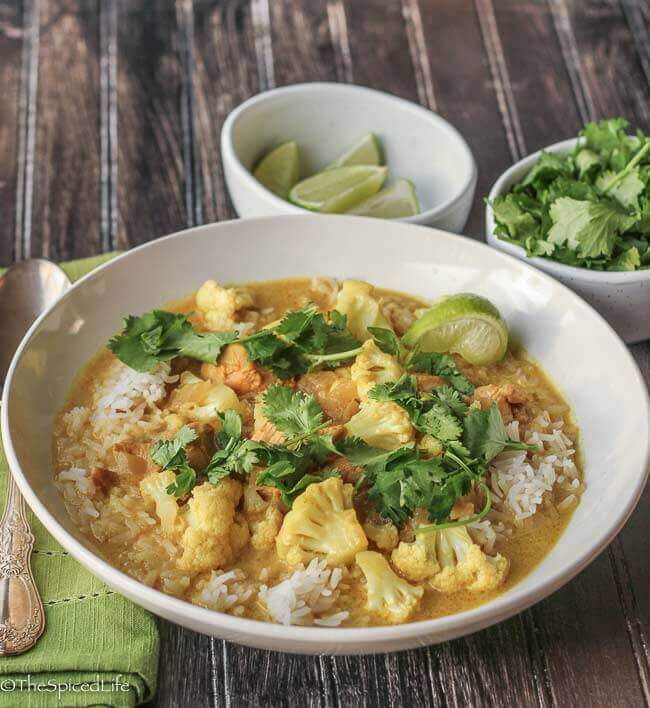 Burmese Chicken Coconut Curry with Cauliflower is an easy and delicious one pot meal that the whole family will love; a copy of Burma Superstar was sent to me by the publishers in exchange for an honest review. Affiliate links have been used to link to items I am discussing. I have good news and bad news (specifically as pertains to this blog and my pace of posting). Isn’t that how everything affected by moving goes? Two steps forward, one step back, until it is finally all done. Anyway, I am using the kitchen now so I should have more scrumptious dishes for you to look forward to. On the other hand, there are still tons of boxes taking up my time, and I am still not happy with my photography area/set-up (these pictures in this post are from the previous house). So expect more delays between posts. And to make matters crazier, the cat jumped on my photography table from the mantle and completely busted the table! Maybe she needs to go on a diet. You may remember that in my review of Vibrant India I said that 10 Speed Press has several gorgeous international cookbooks out right now–and yay me, they sent me several of them to review! Burma Superstar: Addictive Recipes from the Crossroads of Southeast Asia is the second of those cookbooks that they sent me (stay tuned for more!). Burma Superstar is a Burmese (or Myanmarese) restaurant in San Francisco that I would love to eat at some day. But until then I have the next best thing at home in the form of their cookbook. 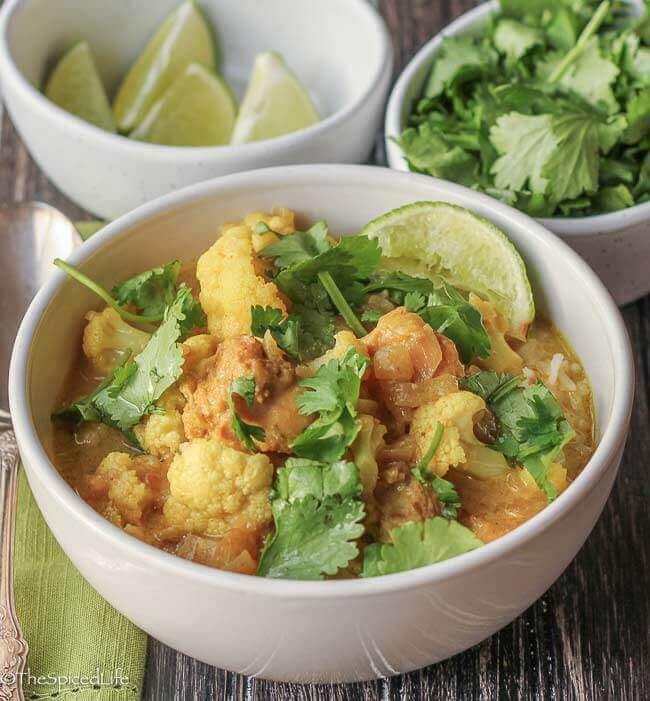 Sections in the cookbook include Curries and Slow Cooked Dishes (my favorite section! ); Vegetables; Stir Fries and Fast Cooked Dishes; Noodles (another favorite! ); Soups; Salad (I adore Burmese salads so hopefully I can source the ingredients, especially tea leaves, for these dishes); Drinks; Snacks and Sweets; Rice and Basics; and, last, Pantry, Tools and Techniques. I pretty much want to eat everything in the book. 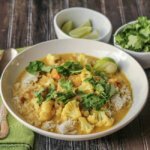 Burmese food is classified with Southeast Asian food, and it does indeed share certain ingredients in common, like the fish sauce found in this recipe. But it is also more influenced by Indian and Central Asian cooking and, like any national cuisine, has certain elements that make it unique (such as the pervasive use of tea leaves). And if you look at a map, Myanmar (formerly Burma) is not nearly as far south as Thailand, Cambodia and Vietnam, just to name a few Southeast Asian countries. 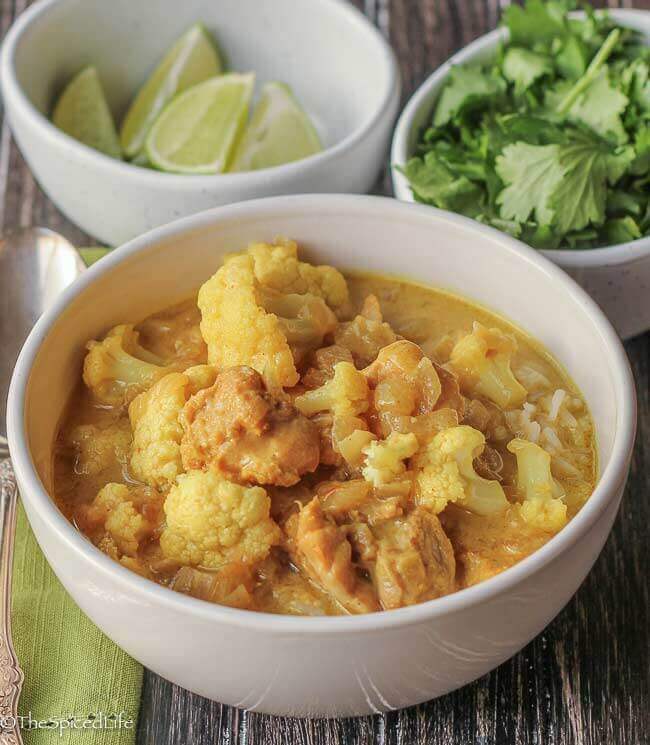 I chose to start with their very basic Chicken Coconut Curry because we were packing up and I refused to shop for any ingredients not already in my pantry. This curry is also used in a noodle dish in the book, Nan Gyi Thoke, so I will definitely be making it a second time. 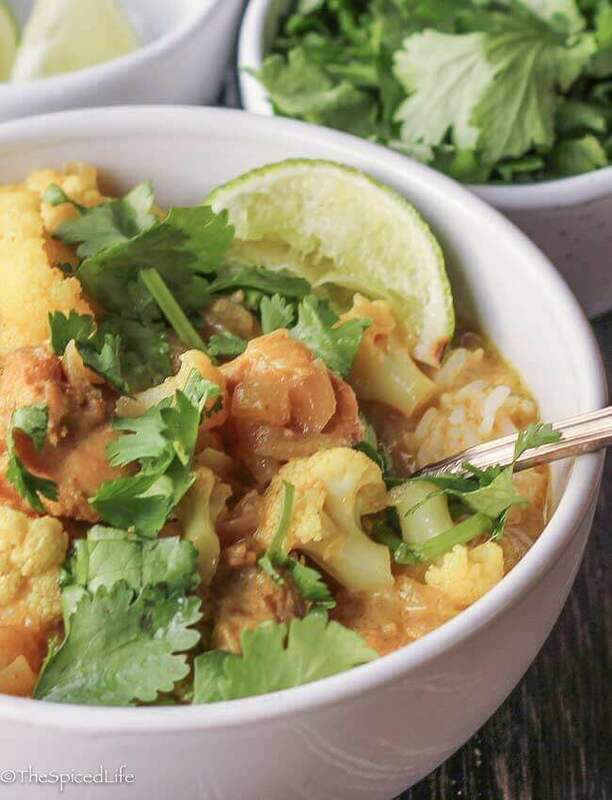 It is easy to make extra Burmese Chicken Coconut Curry, so having a second dish to make with leftovers is especially appealing. Unfortunately, because of the move, I was unable to do that this time. Not to worry though, because my family devoured this! Now in full disclosure, my dish looked nothing like theirs, and I do not think it is because I added cauliflower. I did reduce the oil from 1/3 cup to 1/4 and used half white meat (the latter because John prefers white meat). I just cannot make myself add that much oil to a dish with full fat coconut milk. I have a theory that a lot of delicious dishes are developed in countries where fat calories are justifiably treasured–and I am perfectly happy to eat them in that country or at a restaurant but just cannot do it at home. As it is I still used more oil than I would normally. So my dish turned out a lot more yellow and a lot less deep red. Who knows why, but since I did not follow the recipe exactly I cannot complain–and since we all loved it anyway why would I? Very closely adapted from Desmond Tan, but it was my decision to add the cauliflower. Tan calls for all dark meat, but I always use half white meat because my husband prefers it. Note that this recipe does require a marinade. Chop the chicken into bite sized pieces. Toss with the paprika, turmeric and salt. 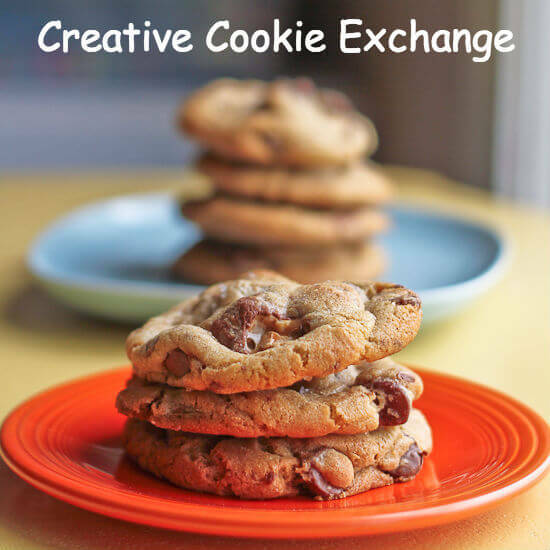 Set aside while you prep the other ingredients or cover and refrigerate overnight. Heat a large (at least 6 quarts), heavy Dutch oven or pot over medium high heat with the oil. When it shimmers, add the onions with a pinch of salt. Reduce the heat to medium low and cook the onions, stirring often to prevent sticking or scorching, for 10 minutes. Add the garlic and continue to cook, until the water from the onions has cooked off and the oil is beginning to separate, about 5 minutes more. Add the chicken and stir to roast the spices in the oil. Add the coconut milk and increase the heat to medium high. Bring to a boil and let it simmer vigorously for about 4 minutes, until the sauce thickens. Add the fish sauce, water and cauliflower. Bring back to a boil and then reduce the heat to maintain a gentle simmer. Simmer gently, stirring occasionally, for 50-55 minutes. Stir in the cayenne pepper and curry powder. Simmer a few minutes longer and then remove from the heat. Let curry sit for 20 minutes before serving if time permits. 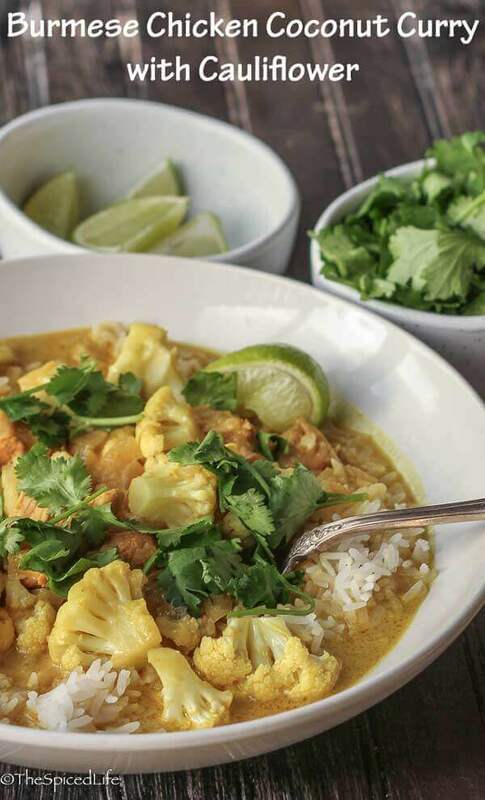 Serve with cilantro and lime wedges. We served over rice. 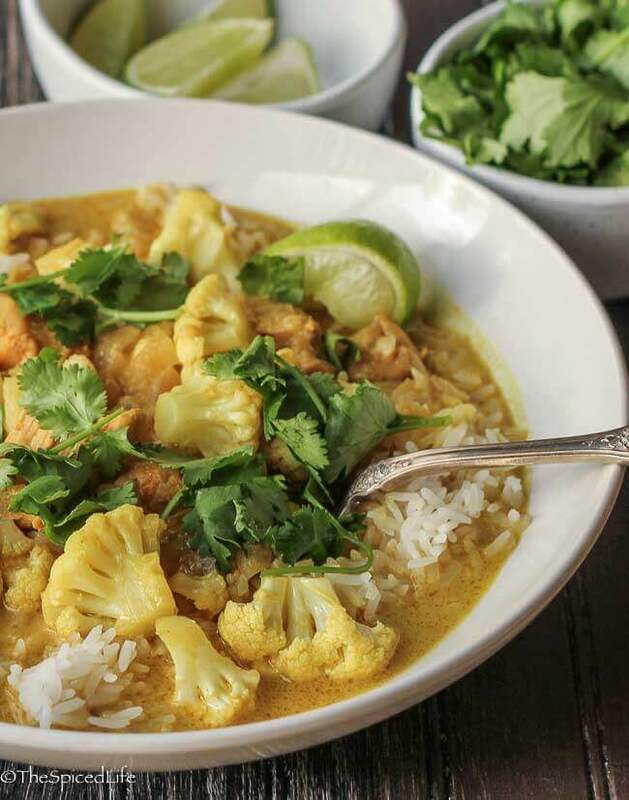 Looking for a Burmese Chicken Coconut Curry collage to pin? Please feed this to me! I figured there would be some serious jumping when I saw your picture of Persephone on the mantle. Your review and curry make me want to run out and get the book. Hi – I just made this and mine is yellow, too. I dudnt use “Madras” curry powder which is red so I think that’s the difference w color (and prob flavor). Still good! I am trying to remember if my Madras curry powder is red–but either way that is a decent theory and it seems possible that some companies make it differently anyway (lord knows that is true of other spice blends). Thanks for commenting and glad you liked it!